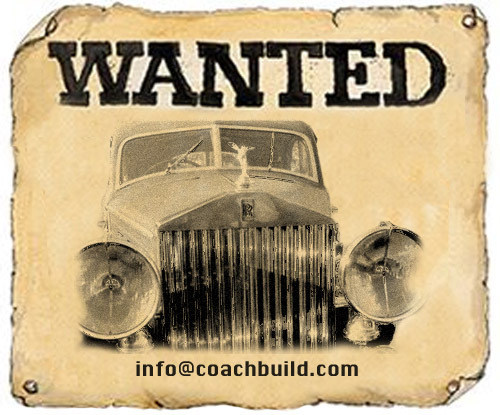 We're looking for one of the two Wraith brothers, descendants of Rolls-Royce and Erdmann & Rossi. Chassis WHC45 is wanted by one of our readers. Erdmann & Rossi had built two similar looking bodies for the Rolls Royce Wraith with chassis numbers WXA106 and WHC45. One was delivered in 1938 and the other in 1939. WXA106 was delivered to Michael Reichsgraf von Althan, who lived in Silesia, and is now with a Mr Kulberg in Latvia. WHC45 was supplied to Lindemann KG, probably for a Mr Doberg. In our gallery we have only three photos of one of these cars, which is painted black. The other one was finished in silver, but it is difficult to get a clear picture of which car is which. The black car sits in the collection of the RIGA Automuseum in Latvia and we're awaiting confirmation about the chassis number. UPDATE: Two period photos of the silver colored example have been added to the gallery.